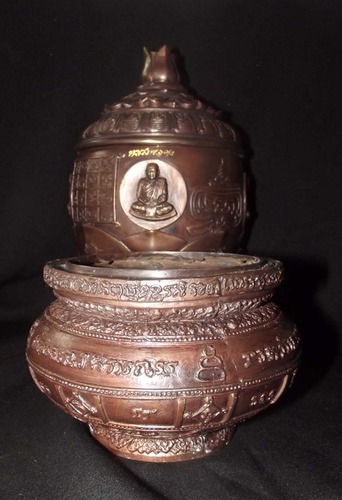 Sacred Bronze alloy Holy Water Bowl from Luang Por Prohm, Abbot of Wat Ban Suan – the Bowl is fashioned from sturdy Bronze made from Smelting Ancient Sacred Artifacts and Yantra Foils, amulets from Great Masters, into one sacred Alloy. 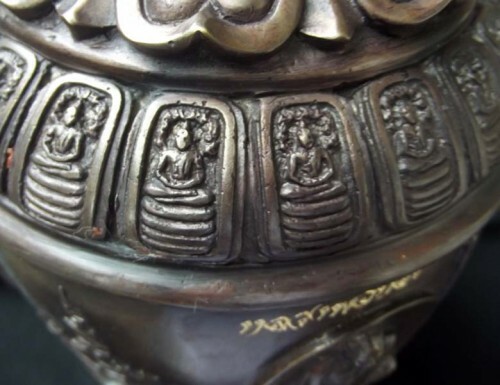 The sides of the Bowl are embellished with the images of Luang Por Iad, Pra Ajarn Kong, and Luang Por Tong Tao, and Luang Por Normo – Empowered with a Host of Southern Khao or Lineage Masters, and released in 2553 BE at Wat Ban Suan Pattalung. There were Two Editions made of this Holy Water Bowl, one with slightly over 50 made and numbered (previous edition to this one) and this second edition which was made in very limited numbers (30) but without the numbered engraving, which the first edition had. The Bowls are a reference issue in Reverence to the Khao or Lineage Masters, and to give the Devotee of Khao or Masters, Ajarn Kong, Ajarn Khun Phaen and Wat Ban Suan an object of Faith to intensify their practice Incredibly, with the Inspiration that is most certain to be received from being able to perform Prayers and Bucha with such Sacred Ritual Paraphernalia at ones disposition. Luang Por Prohm is Abbot of Wat Ban Suan, and Looksit of Ajarn Kong, and the Khao Or Magical Lineage. Wat ban Suan is famous for its Black Sticky Rice Spiritual Cleansing Ritual for Kong Grapan and Expulsion of Black Magic, and Good Health. 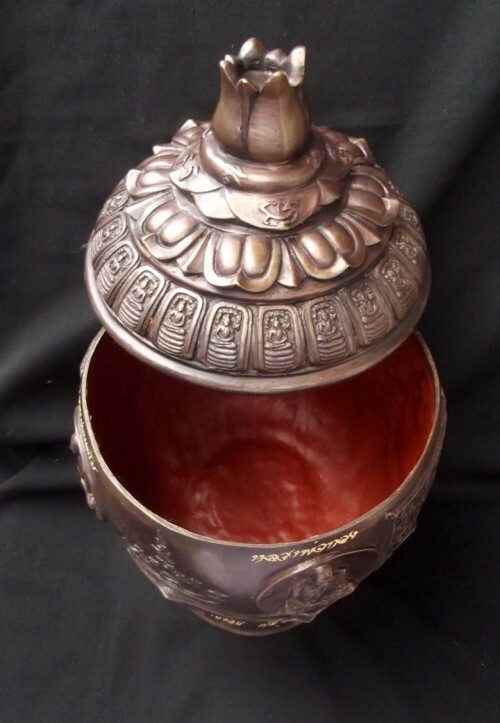 The Bowl measures 6 Inches diameter, and comes with sacred Bronze ‘Grathaang Toop’ (Incense Bowl to put sand in for inserting Incense sticks). 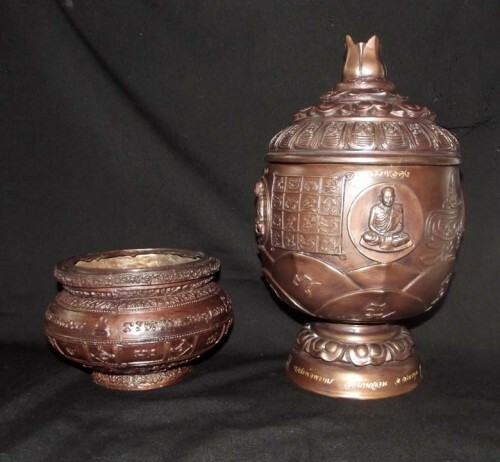 Both the Khan Nam Montr (Holy Water Bowl) and the Grathaang Toop (Incense Bowl) are covered in Sacred Khom Agkhara lettering with Pali inscription of Prayers and Incantations, and Sacred Yantra design. This edition was made in 2553 BE with only 30 examples made in this series. The Bronze has a warm oily reddish finish to the metal, which is called ‘Rom Man Pu’ in Thai. 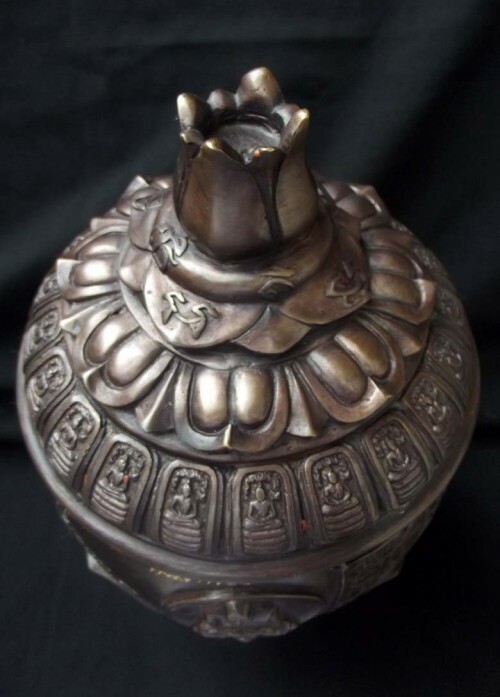 The rim of the lid is lined with Taep Nimit Nakprok Buddha images, in Memorial of Ajarn Chum’s famous Khao Or Sorcery Taep Nimit Nakprok Amulet of 2497 and 2512 BE Miracle Puttapisek Empowerment Ceremonies. 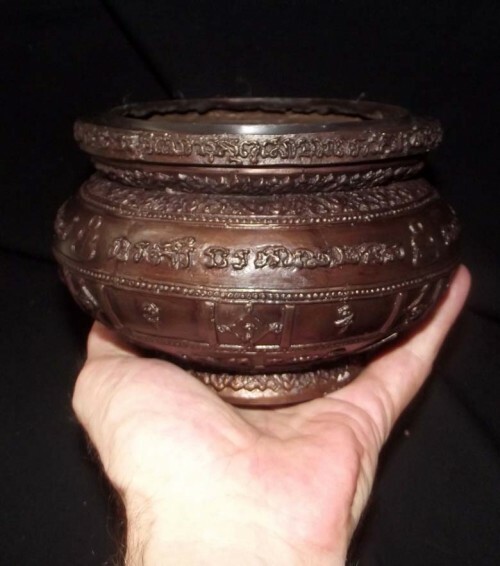 The Bowl should be filled with clean fine sand, or rice grains, and used to insert Incense sticks vertically in the bowl to the front of the Altar/Buddha/Deity. 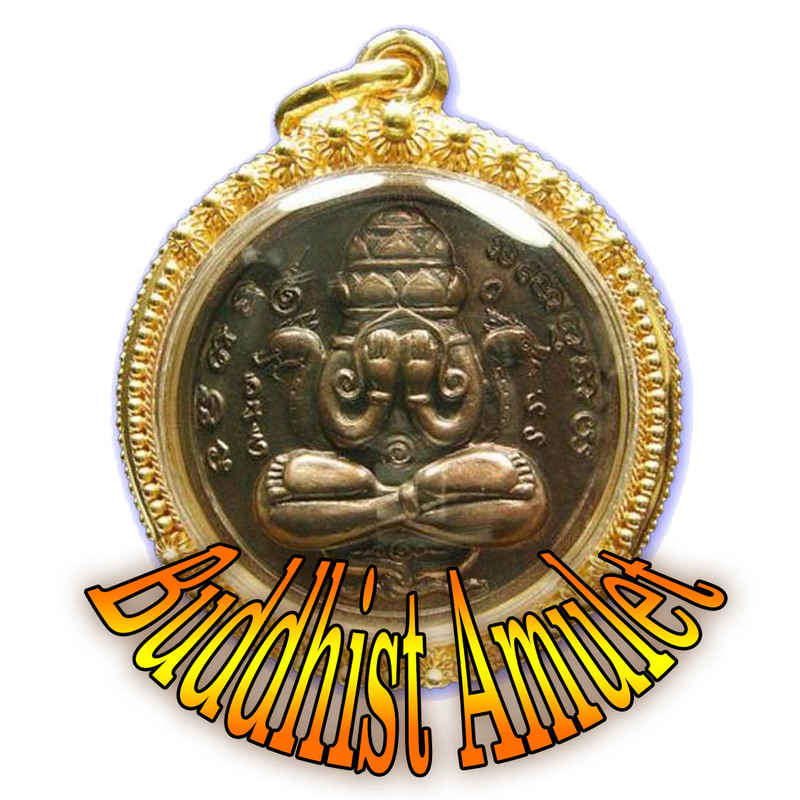 A Most Sacred and Beneficial addition to the personal or public temple, that not only bestows Authentic Sacred Buddhist Blessings, but also Inspires Faith in Prayer with its High Sacred Value and Respectable Lineage History. 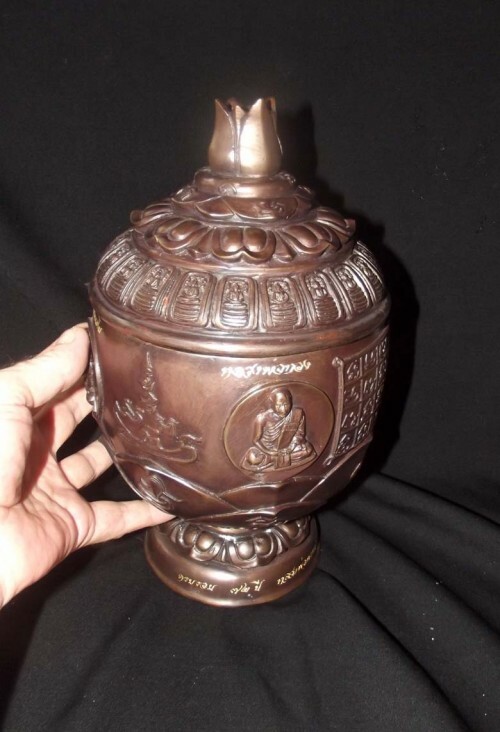 This is the kind of Holy Water bowl that is worthy of gracing the Samnak of any Master Monk in any Temple, and in fact is probably used by one or two of them. Who would not wish to have this Exhibit indeed?